We weren't treated to his familiar, soothing tones, but Apple's chief of design Jony Ive was secretly present in the trailer for Star Wars: The Force Awakens. An extensive profile of Ive in the New Yorker has revealed the Apple man recently chatted to Star Wars director JJ Abrams where he made "very specific" suggestions as to how the perfect lightsaber should look and behave - advice, it seems, JJ took on board. 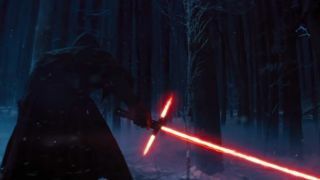 Ive said the lightsaber should be "more analog and more primitive, and I think, in some way, somehow more ominous." He also added, "I thought it would be interesting if it were less precise, and just a little bit more spitty." While we don't expect to see John Boyega sporting an Apple Watch, there's no denying that the much-discussed lightsaber seen in the latest trailer has a bit more crackle and hiss about it, suggesting Abrams absorbed some of Ive's wisdom. The dark side... and the blips.